The global flood or flood of Noah (Major event::17 Bul 1656 AM) is an event recorded in ancient histories in various forms across cultures worldwide. The entire world was covered with water as divine punishment, and only a small number of humans and animals survived. The account in Genesis is the best known and the most detailed account, but the same events are described in the Islamic Qur'an, the Book of Jubilees, and the Book of Enoch. Direct references occur in the Critias and Timaeus of Plato, and the ancient Babylonian Epic of Gilgamesh. 5.1 Was ist mit all dem Wasser passiert? 5.2 Was the flood regional? 5.3 Could a just God destroy innocent life? 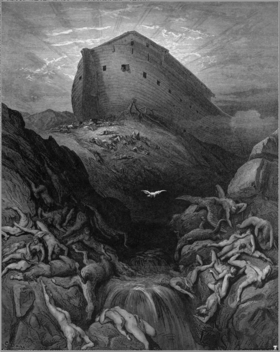 According to the Biblical account, the flood of Noah was caused by a forty day rain that was accompanied by an upsurgence of subterranean waters lasting for one hundred and fifty days. It is largely presumed that the latter was the principal supply of flood waters that covered the earth. Several theories have been put forth to explain the source and eventual recession of these waters. While early models held to the existence of a vapor canopy as supplying the flood waters, the majority of creation geologists now support the waters from beneath the Earth's crust as responsible. The exact depth of this water within the Earth's crust varies with different models. The Hydroplate theory places the water below a 10 mile thick crust, the remnants of which are now the continental crust. Hydroplate theory is the first flood model to deal with the springs of the great deep. Modeling the springs of the deep is an important aspect of any Flood model and one where hydroplate theory excels. It is an important aspect of flood geology but one that still requires much work. The global flood was a popular and fictional myth created by early man, passed from culture to culture and gradually exaggerated. The global flood was a historical event, of which the events were recorded and retained to varying degrees of accuracy in different cultures over the years. Many of those who most vigorously object to the second approach (historic event) do so for philosophical reasons. Because the most complete account of the Flood is found in Genesis, any admission of a major flood in human times would present a threat to Naturalism philosophy. They object to the idea that a God of judgement would reveal the future to a human and then destroy almost all land-living animals. Even evolutionists who agree with catasrophism often seek other explanations. This philosophical objection results in a great number of apparently scientific arguments against a global flood. However, most of these arguments are unfounded and do not hold up to scientific scrutiny. Was ist mit all dem Wasser passiert? Manche, die die Idee einer globalen Flut verwerfen, tun dies, weil sie sagen, die Flut hätte so hoch steigen müssen wie der Mount Everest, weil es in Genesis 7:19 heißt, dass alle hohen Berge bedeckt wurden. Der Mount Everest ist 8850 Meter hoch und sie sagen, es gäbe nicht genug Wasser auf der Erde, um sie so hoch mit Wasser zu bedecken. So the real question is whether it is possible for Mount Everest to have risen to its current height fast enough to fit a time-scale consistent with the Flood. The earthquake that caused the Indonesian tsunami of December 26, 2004 caused an uplift of at least 20 feet (six metres) in a few minutes, which is a speed of about 240 feet per hour (84 metres per hour). At that rate Mount Everest could have reached its current height in about five days. Forces observed in earthquakes are sufficient, if extended long enough, to quickly raise the highest mountain to its current height in just a few days. The result is that, based on the amount of water on earth, and observed tectonic forces, there was the potential to quickly raise mountains. So the global Flood of the Bible is theoretically possible. You can see a seafloor study that traces culprits behind Indian Ocean tsunami for further explanation. If water flooded the earth to the highest mountain today, there would need to be enough water on the earth to prove this could be done. On the surface there is not enough, nor is there enough under the surface of the crust. However, further down into the upper part of the earth's mantle, locked in a mineral called Wadsleyite, it is estimated there is enough water to fill 30 of our oceans. This is more than enough water to flood the enitre earth above it's highest mountains. Although the Genesis account of the flood of Noah has traditionally been interpreted as meaning a global event, some believe it was merely a regional catastrophe. The local flood view is held by old-earth creationists known as Day-age or Progressive creationists. Arguments in favor of this position use the original Hebrew wording, which is ambiguous about whether the flood was universal. Local-flood advocates also cite many ancient historians who have claimed that Noah's Flood was regional. In addition, some Islamic and Greek historians recorded the flood as regional. However, a regional flood makes nonsense of the story. The size of the ark means that its building is likely to have taken several years. That being so, it would always be simpler to migrate away from the region rather than build an ark. In addition, there would be no need to preserve animals through it, since they too could have walked to safety. No conceivable regional flood, in the earth's current configuration, could cover so wide an area as to require an ark rather than feet in order to escape it. This objection refers to the many living things that were destroyed in the Flood. Why destroy the innocent animals? This is answered with an examination of the context. Mortal life, including plants and animals, since the Fall of Adam and Eve, is subject to death. Withholding a global flood would not have saved any animal or plant from death. The justice of God provided a way for many species to be saved on the Ark. God waited as long as his justice would allow, before causing a Flood that would shorten the life spans of individual creatures but would not destroy species: Life would return and the earth would be repopulated. Diese Seite wurde zuletzt am 11. Juli 2013 um 13:33 Uhr geändert.